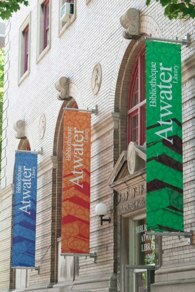 Welcome to the Atwater Library and Computer Centre, a community library, digital learning centre and meeting place located in Montreal’s downtown west by the Atwater métro station. We serve everyone and attract over 100,000 user visits a year. In addition, we do extensive community outreach and partner with a host of groups and schools. We are a registered charity with a mission to foster learning and contribute to the development of the Montreal community. In this respect, we are like the YMCA, Y des Femmes and Tyndale St-Georges Community Centre. We have deep roots in Montreal, yet are a modern, innovative community resource centre. More than just books, we offer courses and workshops to help young and old master technology in the digital age, a state-of-the-art computer centre, literary and educational events, financial literacy sessions, exhibitions on literature and history, meeting space for community groups, and much more. We depend primarily on private donations and volunteer service for our vitality and invite your support as a member, a donor and/or a volunteer. Unlike municipal libraries, we don’t ask people to show ID documents or proof of their address. We’re open to everyone!